Browsing in an indie bookstore this summer, I spotted the book The Radium Girls by Kate Moore on the new nonfiction table. I contemplated buying it. This is an important story – I should read it. But I ultimately decided it was too horrific and depressing. Instead I bought Mozart’s Starling by Lyanda Lynn Haupt, a local Seattle author. I thought it would make a perfect birthday present for my mom, whose passions include both birdwatching and classical music. The starling is an invasive species that is nonetheless charming, having inspired both Mozart and the book’s author. My mom has long believed in removing invasive species and replacing them with natives. I wondered if she would make an exception for the starling. Mom’s birthday was in October, and she enjoyed the book. The Radium Girls tells the story of the girls who worked for the Radium Dial Company, painting dials onto clocks and watches with glow-in-the-dark paint. The source of the glow? Radium, a naturally radioactive element. It may seem shocking today, but 100 years ago the company instructed the workers, many of whom were still in their teens, to lick the ends of their paint brushes to achieve the fine point necessary to paint details on miniature watch faces. The company told them it was perfectly safe. Safe? The girls were slowly poisoning themselves by ingesting small quantities of radium every day for years. I haven’t read the entire book, but I’ve read enough excerpts and reviews to have a fairly good idea of the content. 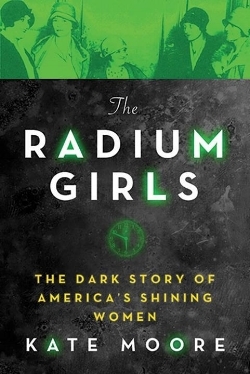 The disfigurement of these girls from radium poisoning and their painful, drawn-out deaths over a period of years is something I’m not sure I want to read about in detail. The story is told in a compelling narrative style that makes the characters come to life, which increases the emotional impact. The Radium Dial Company was an artifact of the early 20th century, a time supposedly before people understood the dangers of toxic materials. Although it seems hard to believe, radium was promoted as being good for the health. But there were hints that this wasn’t quite the case. Marie Curie herself, who earned a Nobel Prize for her discovery of radium, died from radium poisoning in 1934. Moore’s book points out that the company knew of the dangers of radium but hid it from workers, perhaps not unlike the attitude of the tobacco industry toward its customers decades later. Certainly, a corporation wouldn’t dare lie to their workers, customers, or communities like this today, right? Not necessarily. Just ask Wilbur Tennant, a farmer in West Virginia whose cattle mysteriously began falling ill and dying. He suspected that a landfill near his property, owned by DuPont, was responsible. As lawyers delved deeply into corporate documents, they discovered that DuPont knew that its factories had been discharging toxic waste into the landfill for decades but hid the evidence. The compound responsible for the deaths of Tennant’s cattle is PFOA, perfluorooctanoic acid, used to produce Teflon. The extent of the contamination was greater than a single farm in WV. A nonprofit organization conducted a survey and found that water supplies in 27 states exceeded safe PFOA limits. Did this happen decades ago? No. The survey results are from 2015. I first wrote about this story in January 2016, when a New York Times reporter published a detailed account. I am struck by some parallels in the stories. The Radium Dial Corporation hired its own scientists to publish research claiming that radium was safe, even healthy. DuPont hired its own veterinarians to examine Tennant’s farm. They reported that Tennant was not caring for his cattle properly. My goal here is not to paint the companies I’ve mentioned as inherently evil. Their actions resulted in suffering, to be sure. When I learned about the DuPont story, my immediate reaction was to want to boycott the company. But that probably isn’t the best approach. I keep remembering a blog post that Mallen Baker wrote in 2016, called “Four reasons why you should never hate a company if you want to change the world.” His premise was that an adversarial stance stands in the way of appreciating positive steps that the company is taking to remedy past actions or lobbying to convince the company to change its ways. Companies do change, as a result of internal or external pressures. With the US Environmental Protection Agency (EPA) working to dismantle many of the regulations that have led to cleaner air, water, and soil during my lifetime, it seems more important than ever to approach companies who may be guilty of polluting with a message that is not going to put them on the defensive. As hard as it may be to keep an open mind and try to learn all the facts, that’s probably the best way to effect change. Workplaces in the US are safer today than they were generations ago, in part because of the radium girls’ story. Their lawsuits played a role in developing the Occupational Safety and Health Administration (OSHA), which protects workers in this country. By learning from the past, maybe we can create a healthier future despite efforts to weaken regulations. Perhaps I should read The Radium Girls after all.